Kurt Vonnegut Cornell '44 was also known to write about sports when he was a member of The Sun news board. At least when the spirit moved him. 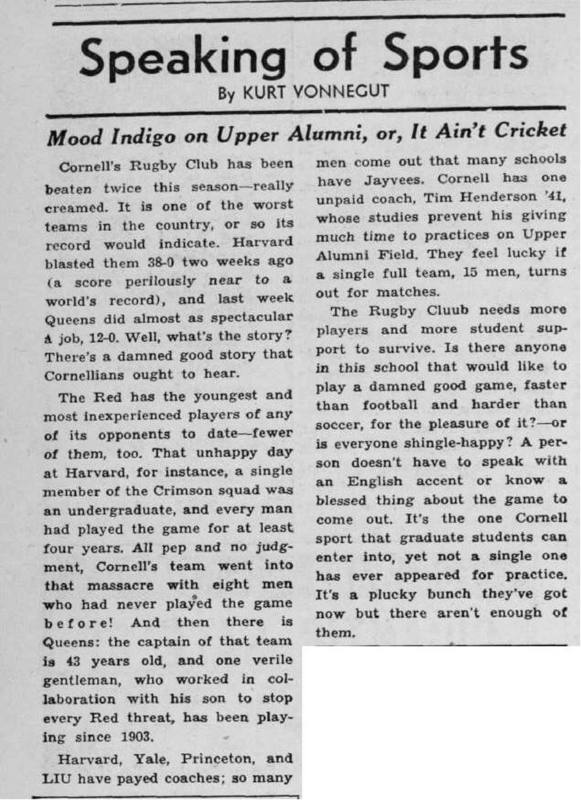 In 1941, the Cornell rugby team was having a particularly tough time of it, and Vonnegut pointed out the problem in this column from May 1, 1941. Cornell's Rugby Club has been beaten twice this season — really creamed. It is one of the worst teams in the country, or so its record would indicate. Harvard blasted them 38-0 two weeks ago (a score perilously near to a world's record), and last week Queens did almost as spectacular a job, 12-0. Well, what's the story? There's a damned good story that Cornellians ought to hear. The Red has the youngest and most inexperienced players of any of its opponents to date — fewer of them, too. That unhappy day at Harvard, for instance, a single member of the Crimson squad was an undergraduate, and every man had played the game for at least four years. All pep and no judgment, Cornell's team went into that massacre with eight men who had never played the game before! And then there is Queens: the captain of that team is 43 years old, and one virile gentleman, who worked in collaboration with his son to stop every Red threat, has been playing since 1903. Harvard, Yale, Princeton, and LIU have payed coaches; so many men come out that many schools have Jayvees. Cornell has one unpaid coach, Tim Henderson '41, whose studies prevent his giving much time to practices on Upper Alumni Field. They feel lucky if a single full team, 15 men, turns out for matches. The Rugby Club needs more players and more student support to survive. Is there anyone in this school that would like to play a damned good game, faster than football and harder than soccer, for the pleasure of it? — or is everyone shingle-happy? A person doesn't have to speak with an English accent or know a blessed thing about the game to come out. It's the one Cornell sport that graduate students can enter into, yet not a single one has ever appeared for practice. It's a plucky bunch they've got now but there aren't enough of them. Sid Cabot's veteran and star-studded rugby team will make its season's bow against the Cornell fifteen this afternoon on Soldiers Field and will try to sustain its two years undefeated record another year. But whether or not the rugby club can retain its Eastern Rugby Union crown is still a doubtful problem in Coach Cabot's mind. The bulk of last year's team will be back, nevertheless the crack kicking of Dave Caldwell and the drive of Sheldon Diets will be lacking, and the loss is a vital one. Another cause for worry is the fact that the ruggers have had only two practices outside of the Cage this spring. That means that the team will have lacked sufficient training in open field kicking. Hence it all boils down to the fact that victory will rely mainly on the team's experience from last season. The Crimson scrum will be heavy and hard driving with hulking Wally De Witt, Johnny Harkness, and Stanford's Tom Killefer as examples of the strength in the forward wall. The backs are fast and most of them have worked together for three springs. Former girdiron captain Bobbie Green and Marsh Holleb can be expected to show plenty of shifty and speedy maneuvering in the afternoon's workout, ably supported by "battering ram" Muddy Waters, who is on the last leg of a colorful five years of Harvard rugby. To add to the star-studded lineup, Tommy Mountain, a Princeton football great, will do his share of kicking and running.